I fell in love with this dress immediately after seeing it online here. This red, white, and blue stripe combo is so crisp and always tugs at my heart! Topshop's stuff tends to run pretty small for me, so I always end up sizing up. Welp, I got the dress and was swimming in it. You know those photos of Jared holding up his pants pre-Subway? I looked like I was wearing the shirt that goes along with those pants! So, I placed a second order for one size smaller. And before you start thinking I'm crazy - Nordstrom has free shipping and free returns, so there's really nothing to lose other than time, and this dress wasn't for anything time sensitive. Plus, after I got the first dress, I checked to see if it was available in one of my nearby stores so I could simply try it on. I love shopping online, but this dress is definitely one of those things that would have been best to try on in store. The pic on the left above is dress #2, which as you can see was still a little big and borderlined looking like pajamas. 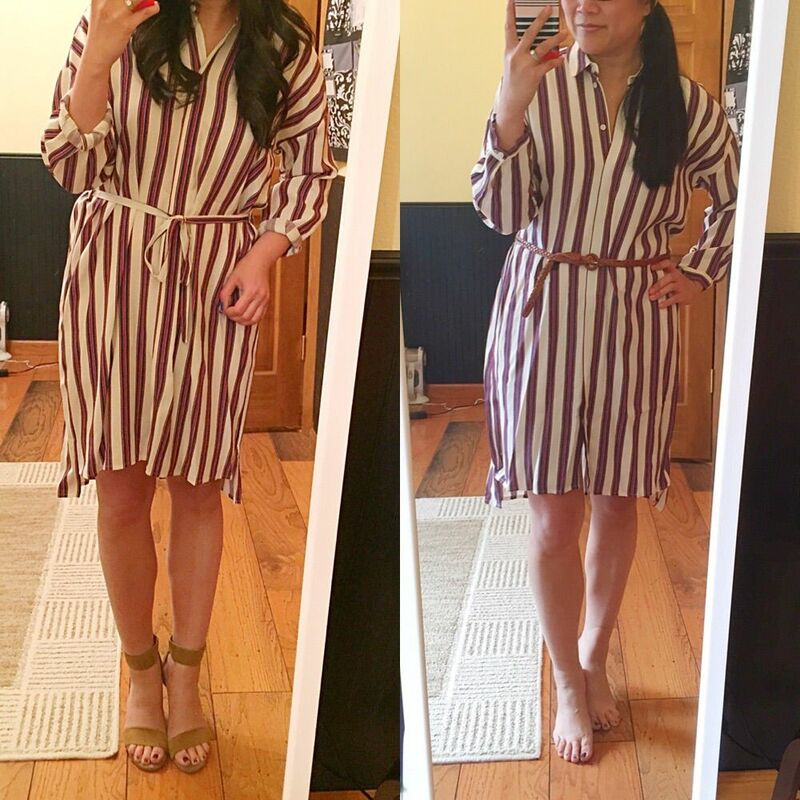 If I didn't love the stripes so much, I would have just given up, but I tried one last time and ordered one more size down (pic on the right above), and it worked like a charm! I also switched the belt for a "real" belt, which visually made the dress even better to me. I'm sure I will still people will still ask me why I'm wearing my pajamas at work since my coworkers always feel the need to make comments of my outfits, but oh well! I love me some stripes and a good shirt dress, so no regrets here! Oh, and if these sandals look familiar it's because I have the exact same pair in red. My little Jeffrey Campbell collection is growing, and apparently I like to buy them in pairs. And in suede! It's hard to resist though because these particular sandals are the perfect heel height and the suede makes them extra comfortable - no weird pinching or rubbing on my feet. And I normally try to avoid any kind of shoe that I need to buckle because, well, I'm lazy, so the velcro closure is such an added bonus for me! I will definitely add some ball of foot pads though to keep foot from sliding forward. No one wants to see that toe-verhang! Super cute dress and we always love this necklace on you! The necklace is so fab!! Thanks so much!! Thank you! Neutrals are my weakness lately! I would be soooo flattered! Definitely a situation where persistence paid off! You look amazing! I am in love with your necklace!! Thanks so much! And the necklace is definitely one of my new faves! I LOVE THIS DRESS! The fit is perfect and the color and everything! Great, great purchase! I always do the same thing…buy online and then it doesn't fit so I order another one and then drive an hour and a half to return it! Aww man, that drive sounds brutal! The things we do in the name of fashion!! Love this dress! So so pretty and love the ways you styled it! The fit is absolutely perfect on you and I adore your necklace! When I find a pair of heels that fit perfectly, are comfy, I buy them in every possible colour :) p/s you do not look as though you're wearing PJs, you look very nice actually. Loving the stripes. I agree - I love to shop online but sometimes the the hassle can be a little frustrating. It's kinda the same with shoes too! Like one size will fit in one brand, but the same size in a different brand is completely different. I can be so hard to know! Omgggg! Hi! How are you! We missed you around these parts!!! That shirt dress is perfect and love the relaxed fit of it. I'm so glad you like it! I'm obsessed! Love this dress! It looks so chic and perfect for summer. It's really great! Definitely great for summer despite the longer sleeves! I would wear this dress in a heartbeat. I love shirtdresses and I love stripes. Better yet the loose fit on this is perfection. Third time is the charm, indeed. I'm so glad I found a size that worked. I really really love this dress! Fabulous Dress and fabulous accessories make for one fabulous YOU!!! So perfect! I don't know how I missed this post, but yeah for finally getting the sizing right! I love it with the warm taupes, and shirt dresses are the best. PS- I'd love for you to stop by on Thursdays and link up your favorite look from this week!